Veteran hotelier, Patsy O’Kane MBE casts her mind back, recalling her earliest memories of the grand old country house on the outskirts of Derry-Londonderry which would eventually become her life’s greatest work. Earlier this year, Patsy stood down after three decades at the helm of the Beech Hill Country House Hotel, signing off on a deal that sees the 31-bedroom luxury venue sold to a company called The House Collection, owned by brothers Barry and Adam Kemp from Donegal. It was a bittersweet parting for Patsy. She had championed a plan to buy the old house from the moment she first saw that it was for sale in 1989. Despite the unforgiving financial climate at the time in Northern Ireland and the misgivings of her father, Leo Donnelly, an experienced hospitality operator, she knew she could make a go of the project. Her tenacity paid off. In her three decades of ownership at the Beech Hill, Patsy almost tripled its quota of bedrooms and established the hotel as one of NI’s leading wedding venues. During that time, the four-star Beech Hill has also played host to a remarkable array of celebrity guests including Bill and Hilary Clinton, Ted Kennedy, John Carey, Will Ferrell, Seamus Heaney and Stephen Rea. 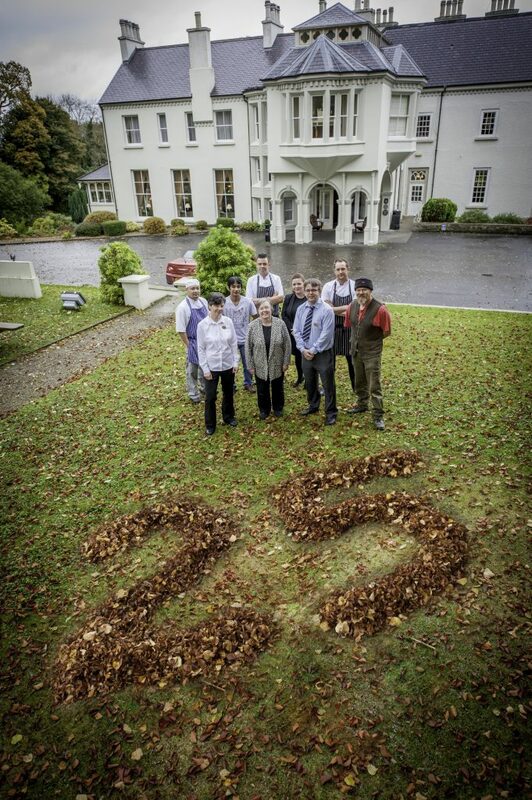 Patsy is pictured outside the hotel with some of the staff during its 25 anniversary celebrations in 2016. At first glance, the hotel trade seems an odd destination for a trained occupational therapist. And Patsy O’Kane had already obtained work in her chosen field, securing a post at Altnagelvin hospital on the outskirts of Derry-Londonderry at the start of the 1970s. Her husband, Joe, was a teacher at nearby Faughenvale. But Patsy came from a family with strong ties to the hospitality trade. Her father, Leo Donnelly, was the owner of a very successful fish and chip shop in the mid-Ulster market town of Magherafelt. In 1971, he acquired the property next door and went on to open The Arches, one of the region’s first licensed restaurants. During those years, Patsy was studying for her career in occupational therapy but she returned faithfully to her home town at weekends to play her part in the family business. Patsy was intrigued by the old Beech Hill property when it came up for sale in 1989. The original house had been built by the wealthy Skipton family in the early 1600s, but was twice burned to the ground before the present dwelling was erected in 1729. Patsy persisted, however, and eventually she prevailed. She and her father went to view the property and subsequently, they took it on. After a period of refurbishment, the hotel opened in April, 1991. It had just 12 bedrooms initially, but the character of the original house had been largely preserved. “Changing a listed building means you’re into a lot of money and so you try to upgrade things rather than change everything,” says Patsy. 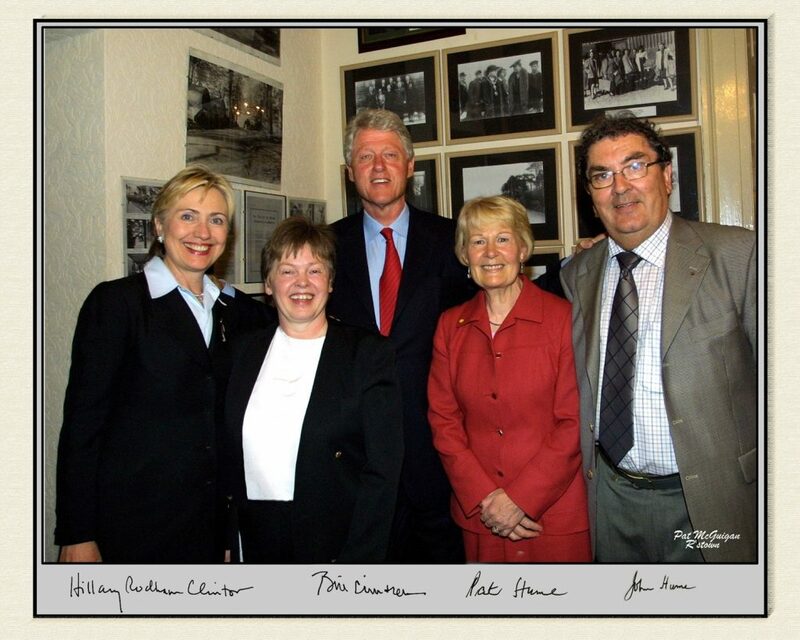 Patsy is shown here during a visit to the hotel by Bill and Hilary Clinton along with the former Foyle MP and SDLP leader, John Hume and his wife, Patricia. Leo kept his restaurant in Magherafelt open, eventually selling it on in 1989 following his retirement. He then transferred his efforts to the Beech Hill where he helped Patsy keep on top of building maintenance. Over the years, the hotel’s room quota grew to 30 and a wild garden was cultivated alongside an all-year-round marquee as the Beech Hill established itself as a leading local wedding venue. And it wasn’t only among the guests that celebrity was to be found. There were notable names among the staff too, including leading NI chefs, Michael Deane and Noel McMeel. In 2014, Patsy’s services to hospitality were recognised when she received the MBE at Buckingham Palace and two years later, she was back for a royal garden party, her first official engagement as the new High Sheriff of Derry-Londonderry. “I’m going to miss it,” she concedes. “But it’s time to support my own family now and I have been in Dublin a lot recently. “My two girls live there and have small children and it’s great that I can just go down and help them one or two days in the week.